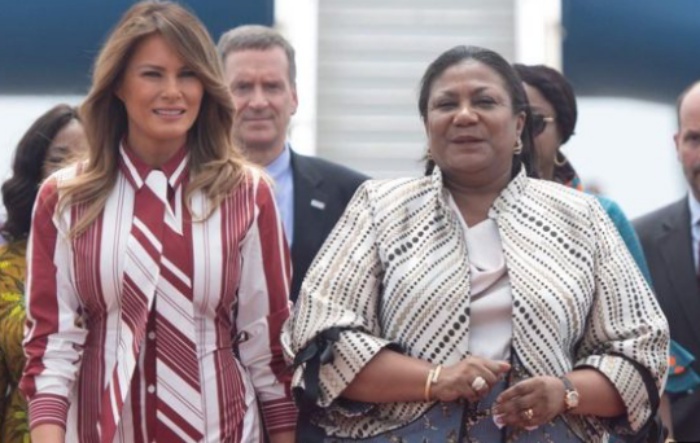 The First Lady of the United States of America, Mrs. Melania Trump, has arrived in Ghana today Tuesday, October 2, 2018 to start a four-country tour of Africa. Mrs Trump’s plane touched down at the Jubilee lounge of the KIA at exactly 10:06 am on Tuesday. But another compared her unfavourably to former First Lady Michelle Obama who was warmly received with her husband on a trip in 2009. Mrs Trump, born Melanija Knavs in Novo Mesto, Slovenia, on April 26, 1970, is the wife of Donald Trump, who was sworn in as the 45th President of the United States of America in January 2017. Melania moved to the US in 1996 to pursue her modelling career and became a US citizen in 2006 after she married Donald Trump in 2005. She is the first naturalized and second foreign-born US citizen to become the First Lady, after Louisa Adams, wife of the sixth president, John Quincy Adams. Mrs Trump came from a humble background, born to an Austrian father, Viktor Knavs, who worked as a car dealer, and a Slovenian mother, Amalija, who worked as a patternmaker at children’s clothing manufacturer, Jutranjka, in Sevnica.